Having developed the safety labels, CEMA has identified the labels that belong on Bulk and Unit Handling Conveyors and the optimized locations to place those labels. To promote safety throughout the industry, the Safety Label Placement Guidelines contained in the Safety Label Brochure are presented below as a service for review and use by manufacturers and users alike. CEMA Safety Labels and Placement Guidelines were developed by the CEMA Safety Committee to provide for members and non-members consensus advice for the selection and application of safety labels for use on conveyors and related material handling equipment to assist in accident prevention. The labels by themselves cannot prevent unsafe acts. The label and placement program is intended as a voluntary guide and should be incorporated into a comprehensive safety program by users of conveyors and related equipment as part of their effort to prevent injuries. Should any of the safety labels supplied by the equipment manufacturer become unreadable for any reason the equipment USER is then responsible for the replacement and location of these safety labels. Replacement labels can be obtained from CEMA STORE or your equipment supplier. The Entire CEMA Safety Label Program is detailed in CEMA Brochure 201 – “Safety Label Brochure” which is available for purchase from the CEMA STORE. Our labels have been developed for each OEM Conveyor. These labels point out standard safety issues associated with the operation and/or maintenance of the equipment. Our material specifications are listed on this page along with our placement guidelines. Included on this page as well are CEMA’s Posters that are set-up for you to use your choice of a printer for your “User’s In-plant Safety Program”. Our Horizontal / Vertical labels are listed below for you to review. 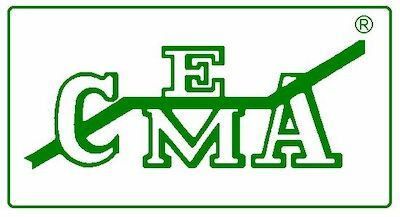 Purchase CEMA Labels on the CEMAstore. If you cannot purchase from the e-commerce store, use our CEMA Safety Label Order form pdf. 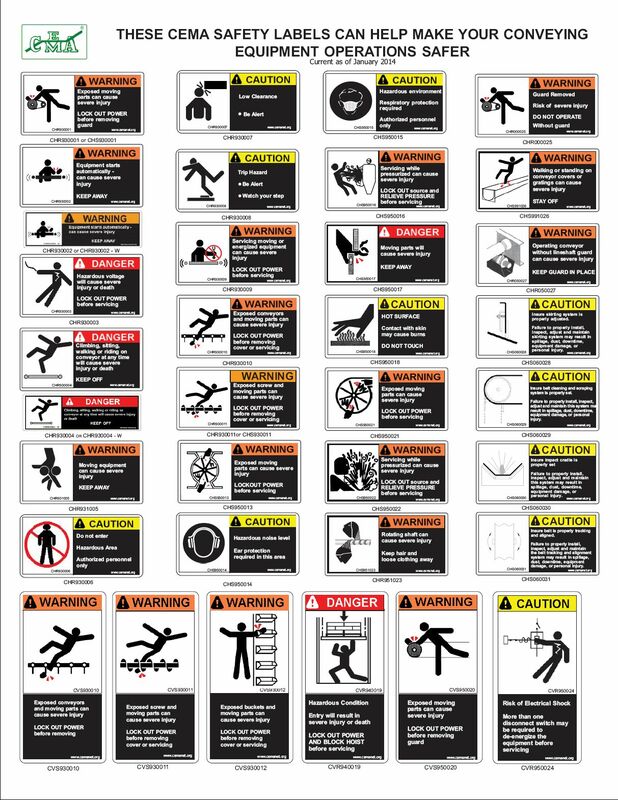 These labels are 5″ wide x 2 1/2″ high and are classified as “Danger–Warning–Caution” labels. The materials that are used are listed below. Additionally, we have labels available that are: 5″wide x 1.5″ high. The labels are 3″ wide x 2 1/2″ high and are classified as “Danger–Warning–Caution” labels. The materials that are used are listed below in the ‘Label Specifications’ section. These labels are intended for interior use and depicted by an “r” on the CEMA Label Number as indicated on the “CEMA Safety Label Meanings”. High adhesion to most difficult substrates, especially plastics. These labels are intended for exterior use and depicted by an “s” on the CEMA Label Number as indicated on the “CEMA Safety Label Meanings”. Heat resistance, dimensional stability, outdoor use, weather resistance. Adheres to Stainless Steel, Aluminum, Painted surfaces. Proper procedures should be used in applying these or any other labels. Ensure that the surface is cleaned and free of dirt, dust, grease, and moisture. If the surface is painted, ensure that the paint is dry. Surface temperature above 50 degrees F.